Dr. Scott J. 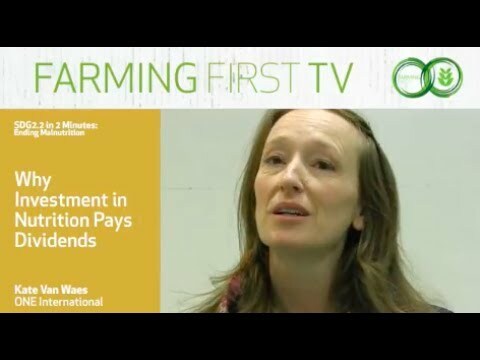 Angle, President and CEO of IFDC and Farming First supporter explains how farmers can be supported to keep their costs low and their yields high through efficient fertilizer use. Fertilizer is one third of the agro-input technological trinity (improved seed, irrigation, and fertilizer). Its use has been particularly successful in addressing food security-related issues in several countries in Asia and South America, for example during the Green Revolution. However, judicious fertilizer use is an over-arching issue in both developed and developing economies. In sub-Saharan Africa, average fertilizer use is less than 25 kilograms per hectare, while parts of Asia and other developed economies face overuse or unbalanced fertilization. Both conditions lead to low crop productivity and declining soil fertility. Improving the “uptake efficiency” of fertilizers (that is, ensuring as much fertilizer is used by the plant as possible) can mitigate the climactic and social effects of both over- and under-use of fertilizers. In Europe, North America, and many parts of Asia, the agricultural practice of allowing plant nutrient reserves to become depleted (nutrient mining) for farming ceased several decades ago. Unfortunately, nutrient mining continues in many other parts of the world. The low use or absent use of fertilizers and other nutrient sources not only makes the agriculture system more vulnerable to climate variability, it exacerbates climate change by reducing soil’s ability to capture carbon from the atmosphere. On the other hand, excessive and imbalanced fertilization results in soil acidification, eutrophication of water bodies, air pollution, and greenhouse gas (GHG) emissions. Toward helping farmers profitably practice low-emission agriculture, IFDC promotes climate-smart management approaches and technologies, including the use of balanced fertilizers, urea deep placement (UDP), and integrated soil fertility management (ISFM). Since losses associated with nitrogen-based fertilizers form a significant part of agriculture’s contribution to global GHG emissions, increasing nitrogen use efficiency (NUE) is paramount. In developing countries, NUE can be as low as 30 percent, meaning plants use only 30 per cent of the nitrogen applied. Our research demonstrates that improved management practices and balanced plant nutrition, including incorporating appropriate amounts of secondary and micronutrients (SMNs), increase nitrogen uptake and boost farm yields by 20 to 50 percent across various sub-Saharan soils and crops. These fertilizers also increase plant tolerance to drought and can improve water use efficiency by 250 percent. This use efficiency also results in more nutritional crops: IFDC found that some formulations can increase the amount of zinc in grains by as much as 65 percent. Fertilizers that include appropriate amounts of secondary and micronutrients can increase yields by as much as 35 percent as seen in this maize demonstration plot. IFDC has pioneered the development of UDP technology in several countries in Asia and Africa. The technology, the application of 1- to 3-gram urea briquettes 7 centimeters below the soil surface, decreases urea use by 30 percent while increasing yields by 15 percent in rice. Emissions from nitrous oxide, a GHG 40 times more potent than carbon dioxide, are decreased by 60 to 80 percent through the use of UDP. With the assistance of the Government of Bangladesh, we helped more than 2.5 million Bangladeshi rice farmers adopt UDP. The savings produced, along with higher yields, has these farmers earning $220 more per hectare. Additionally, the Government of Bangladesh saves $30 million per year on fertilizer subsidies. In Africa, the story is the same. In Mali alone, adopting fertilizer deep placement (FDP) on 5,900 hectares has saved nearly 457 tons of urea, allowing farmers to bring an additional 4,000 hectares under rice cultivation, producing an additional 14,000 tons of paddy rice production. Balanced nutrition and UDP are part of our ISFM approach. Other ISFM strategies include crop rotation, legume introduction, and crop-livestock integration systems. Fertile and productive soils are vital components of stable societies, and ISFM strategies protect these. As one ancient Sanskrit text states, “Upon this handful of soil our survival depends. Husband it, and it will grow our food, our fuel and our shelter and surround us with beauty. Abuse it and the soil will collapse and die, taking humanity with it.” Our reliance on the soil is as strong today as it was then. Unfortunately, many soils have been mined by continuous cereal cultivation, producing a trend of decreasing yields and organic matter. ISFM practices help reverse these trends by increasing yields and incorporating biomass back into the soil. IFDC-assisted farmers in sub-Saharan Africa using ISFM have more than doubled their productivity and increased incomes by 20-50 percent. In addition to increasing incomes, soil may be our strongest ally in practicing low-emission agriculture, as in only a matter of decades, soils benefiting from ISFM can sequester up to 1,000 kilograms of carbon per hectare per year. ISFM techniques have helped many farmers, such as these Congolese women who learned improved planting techniques from Congolese League of Women Peasant Organisations (LOFEPACO). These current practices have ensured greater global food security and enabled farmers to profitably practice low-emission agriculture. Despite this, new and novel technologies will be needed to meet the challenges of a growing population while still safeguarding the environment. To this end, we must continue supporting research in these areas to bring about next generation fertilizers and management practices. This approach must transform the fertilizer industry across the entire value chain, starting with the research and formulation of new plant nutrition products and extending to enabling farmers to market higher quality products that are more nutritious and produced in an environmentally friendly manner. 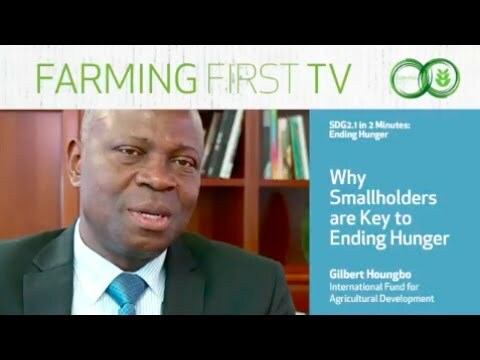 This week, as part of the #SDG2countdown, we are hosting blogs that show progress towards SDG2.3 – doubling smallholder productivity & incomes. Adrian Johnston, Former Vice President of the International Plant Nutrition Institute in Africa & Asia, explains why improving soil health is a critical step towards this target. Fertilizers were developed to provide farmers and gardeners with a rapidly available source of nutrients. Just like humans need a good diet to be healthy and strong, so do our soils. Most fertilizer products provide either a single nutrient, or include a group of nutrients. Plants need a total of 17 nutrients to complete their life cycle of growth and seed production, and fertilizers – whether mineral or organic – help the soil provide those vital nutrients to our crops. When a nutrient is absent, or in low supply, the growth and yield of the plant is severely limited. Farmers have played a major role in meeting the nutritional requirements of a growing world population, and the use of fertilizers has made a significant contribution. By helping farmers grow more on less land, much land has been spared from conversion into farmland, which in turn has reduce the amount of carbon released into the atmosphere through deforestation. As the world must now strive to double agricultural productivity, whilst minimizing greenhouse gas emissions and protecting the environment, the way farmers choose to manage soil health on their farms is going to become more important than ever. There is a critical need to educate farmers on how to apply fertilizer from the right source, at the right rate, time and place, in order to optimize crop yields and profits, while minimizing any negative environmental impact. How this can be done, was the subject of a recent webinar that the World Farmers’ Organisation and International Fertilizer Association recently ran. Inspired by the launch of the new Nutrient Management Handbook, that serves as a blueprint to farmers worldwide on how to improve soil health on their farms, we discussed a variety of issues that we believe will help farmers achieve the triple win of boosting productivity, sustainability and resilience. What are the benefits of good nutrient management? Success in good nutrient management comes in the form of a healthy, high yielding crops, that are profitable to the farmer and leave no negative environmental impact. For years, the impact of fertilizer use on crop yield has been clearly documented on a global scale, with cereal grain production keeping pace with global population. Reviews of the population and food supply issue have suggested that as much as 50% of the current global population is dependent on fertilizer use, especially nitrogen. However, with the use of fertilizers comes the responsibility of farmers, and their supporting research and extension agencies, to practice Best Management Practices (BMPs). Research has determined that certain management practices not only improve the effectiveness of fertilizers, but also minimize any potential for negative environmental impacts. Recently the global fertilizer industry has supported the promotion of the 4R Nutrient Stewardship concept. These include selection of the right fertilizer source, application at the right rate, at the right time, and in the right place. When considered together, especially in the context of a specific location and crop, these right practices can support productivity, profitability and environmental stewardship. The 4R approach provides a unique opportunity for farmers to play a major role in working with extension and research advisors to come up with an efficient and effective set of practices for their location. Moving forward, the demand for cereal grain production continues to increase at a rapid pace to meet the demands of a growing population and shifting dietary needs. Actively engaging the agriculture community in the process of building improved nutrient management practices, along with their other management demands, is a positive step forward in addressing concerns related to global food security. Plants need nutrients, whether from fertilizers or organic sources, to complete their life cycle of growth and seed production. Organic sources of nutrients, like livestock manure and compost, provide most of the same nutrients found in fertilizers. Organic manure also has the advantage to provide a large range of nutrients to plants during decomposition. However, the nutrients are generally lower in concentration by weight, and are far less predictable in their release pattern. In order to sustainably increase yields, and enhance soil organic matter, farmers are encouraged to pursue Integrated Plant Nutrient Management, which entails (among other methods) starting with on-farm organic sources and then supplementing them with manufactured fertilizers. Manufactured fertilizers and organic sources of nutrients can, and should, be used in a complementary fashion. Grain legumes make up an important source of dietary protein and income for smallholder farmers in sub-Saharan Africa. Farmers currently apply little or no fertilizers to their grain legume crops, relying on the natural nitrogen fixation capacity of the crop to meet its nutritional needs. Unfortunately, this is not enough given the deficiency of nutrients in many of these soils. In Kenya, International Plant Nutrition Institute (IPNI) staff have conducted soybean trials in farmers’ fields found that grain yields could be increased by 1 t/ha when fertilizer was added. Further addition of manure and lime on these soils increased yield another 0.5 t/ha. Investment in fertilizer alone increased profits by US$400 to $1200/ha. This improved productivity clearly indicates improved soil health in supporting increased productivity and profitability. Access to water has created a challenge for many Indian farmers, increasing interest in alternative crops to flooded rice. Working in West Bengal, research staff at IPNI have focused on developing a rice-maize rotation as an alternative to rice-rice to address the water challenge. Maize has proven to be an excellent crop given its high yield, profitability, reduced water requirements, and greater tolerance of poor weather and pest stress. Balanced nutrient supply is the principle challenge most Indian farmers face when it comes to improving productivity (soil health). While nitrogen is the most limiting nutrient, addition of potassium, phosphorus, sulphur and zinc were found in this work to add US$80 – $290/ha to the farmer’s income. Not only was the maize yield increased, but similar responses were recorded in the rice in these on-farm trials. Helping farmers build an understanding about the role that balanced fertilization plays in improving productivity and profitability from healthy soils is key to the future food security in South Asia. Good management of soil health can be the key to boosting farmers’ productivity and income, whilst promoting sustainability and resilience in our environment, making it a key component of our efforts towards meeting SDG2. By ensuring all farmers around the world have access to the tools and knowledge they need to promote better soil health, we can be one step closer to ending hunger.